Home gym flooring is one of the most important aspects of building and maintaining the best home gym in 2019. Proper gym flooring protects your home’s floor, your valuable exercise machines, and most importantly from various injuries. Why Is Home Gym Flooring Is Important? Before you head out to buy your gym equipment, ask yourself whether you have considered the best design for your interior? That includes gym mirrors and the type of flooring too. Let’s admit it: a gym is a gym regardless of whether it’s a part of the house or not. Even the flooring for a gym is much different from what we use in our homes. Inappropriate flooring will result in damage to the floor and your equipment too. In order to avoid this, you need to choose the best flooring type for your garage gym. Now, let’s take a look at some interesting flooring options. If weights and equipment are integral to your workout regime, then you should consider getting flooring done as a first choice rather than later. Protective home Gym Flooring can help your equipment and your house from unsightly cracks and scratches from dropping heavy stuff on the floor. Another thing is that these increase the grip levels in your garage gym and can help prevent accidents that occur due to lack of footing. This is especially important if you are planning to get on a regime of Crossfit because Crossfit has a lot of lateral and horizontal movement. When you consider that it’s not very expensive to do up a small garage gym with these flooring options, it actually becomes a must-have for many gym enthusiasts. Many different sizes available. Made from recycled materials. 3/16" thick. The basic package comes with a 4' x 4' tile (16 sq feet). However, you can order sizes up to 4' x 25' feet. Interlocking foam. 3/8" thick. Each order Comes with twelve 2' x 2' tiles for a total of 48 sq feet. Interlocking foam. 1/2" thick. Each order Comes with six 2' x 2' tiles for a total of 24 sq feet. Single piece mats, 27” X 40” with 12 mm thickness home and gym use. Garage gyms are where most people get their game on when it comes to fitness. If you are looking at best options for your home which are also cost-effective, then I would recommend you to start off with interlocking mats from various manufacturers that work to provide protection in addition to being easy on the wallet. You can get these huge dense mats new or used and if they aren’t too beat up, they will definitely serve your purpose. For starters, before investing into anything substantial, this could be your best bet to get durable protection for your home gym. Since these are not that expensive, you can move on to better mats the more you start using your gym. 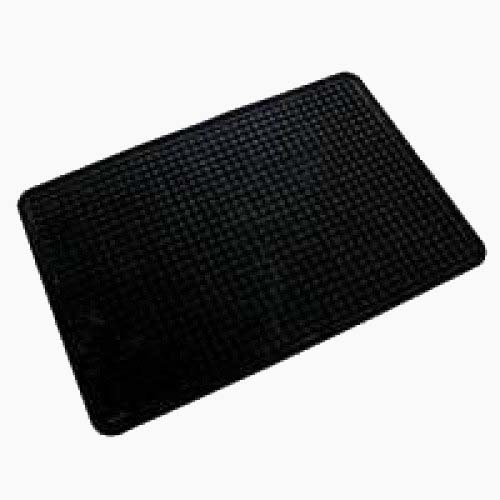 The only problem with these mats is that depending on the type of mats, if they are not very heavy or grippy, you will find that it moves around a lot during heavy exercise. This could be surprising for some of you, but rubber horse stall mats are predominantly used in many garage gyms. They were originally designed to help ease the pressure on horse’s knee joints. But the biggest plus is they are dense and heavy and a great fit for garage gyms and workout rooms. Horse stall mats usually come in size of four feet by six feet, and that would weigh about 100 pounds for an average garage gym mat. That means you can easily carry them with the help of your friend or partner. The other reason why gym owners prefer rubber horse stall mats is that they do not interlock and they have nice edges. The price is another advantage for buyers because it costs very less per area and is definitely a bargain. If you prefer an average quality material for a lower price than horse stall mats, this one is for you. Academy flooring mats are widely used in sports practice and for outdoor activities. They are a great fit in the gym as well. However, they are not as easily available as other flooring mats. Should you have any concerns about the quality of the mat, check out the reviews and complaints online. If you want to make your garage gym look more professional, then luxury flooring would be the right choice. Rogue fitness mats are among the best luxury flooring materials preferred by most garage gym owners. They are costlier than the other two mats mentioned above but you should seriously take a look at their advantages. They are long-lasting and most people who bought them online have given a 4 out of 5 rating mainly because they are durable, and belong to the higher end quality of flooring mats. Ordering Rogue fitness mats online means you have to bear the shipping expenses too. Each seller might put a different price on shipping, so this is something you will have to check out with multiple vendors. However, make sure not to make your online shopping an expensive affair. Rogue fitness mats are best suited for commercial gyms where the quality of the mat plays a major role keeping in mind the safety of the floor and equipment. Here are a couple of materials commonly used in home gyms but yeah they have their own disadvantages as well. This is a type of rubber tile that wholly consists of rubber so it doesn’t break or crack easily even when under severe duress. Its surface is slick but offers enough grip and also easy to keep clean. It comes in 24” square mats which are usually 3/8” thick and offer good protection from drops of light to medium weights. Another important fact is that since it has no unpleasant smells, it works great for home gyms. Garage gym owners from around the world have preferring cork flooring for years mainly because it’s environment-friendly and crafted out of 100% renewable and biodegradable materials. However, the fact that cork floorings are too soft makes you think if you should really use them in your home gym. The plus point of this type of flooring is that it absorbs shock easily and doesn’t get damaged on equipment falls. But on the downside, they get torn up pretty easily when objects are scratched or moved over them.View more information on garage gym. If you want to add a bit of style and yet still keep it functional, then you might do well to opt for this type of flooring. If you are just lifting medium weights, then you can consider this kind of flooring for your home garage gym. While most consider that wooden flooring is good for shops, and other utilities, wooden floors are very resilient and can take a lot of punishment when it comes to dropped weights and heavy deadlifts. This isn’t exactly the best flooring for your garage gym but if you love a wide choice of colors and light-weight flooring material, then this one with EVA foam could be a great choice. On the upside, they are much cheaper than other home gym flooring materials but on the downside, they don’t decompress well. They are easily dented when weights are dropped. Furthermore, the surface of foam tiles is often mushy and uneven especially when a person with heavy weights is standing over it. All factors considered every gym needs a good foundation where people can push their limits without having to worry about wrecking their floor tiles. And the right type of flooring can give you peace of mind. Since they come at a decent price, you can definitely opt for one and it won’t break your bank. Do let us know what you feel about different types of flooring tiles and pattern.